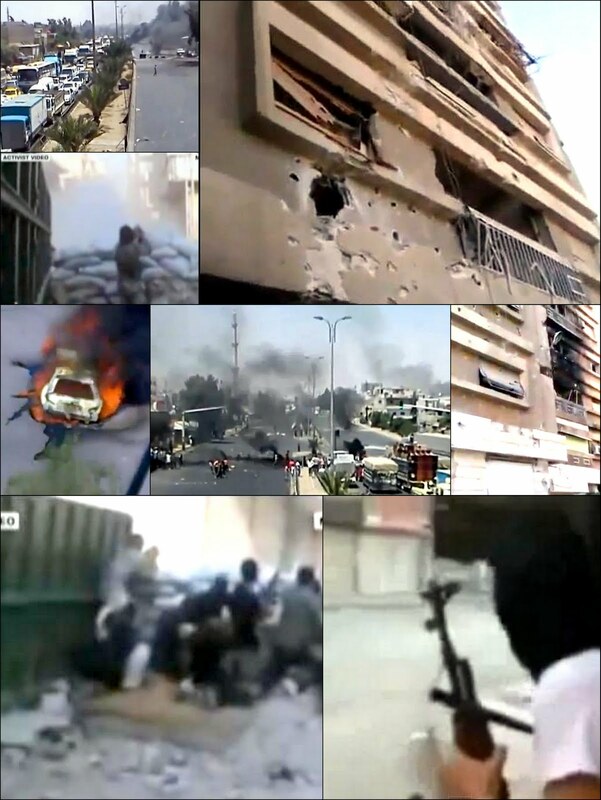 Urban warfare in and around the Syrian capital Damascus today entered its third day with no signs of abating. The capital city is now seeing the biggest military deployment in the 16-month uprising as state forces try to stifle a "Damascus volcano" offensive mounted by the opposition Free Syrian Army (FSA). Video clips uploaded by opposition activists (from which I captured the images for this post) showed insurgents hiding in sandbagged alleyways, firing rocket-propelled grenades and machine guns amid clouds of dust as gunfire crackled. Rebels burned tires and blocked some streets to ease pressure on the fighters. Black columns of smoke billowed over the capital. Monitors and activists say the regime had early Tuesday deployed helicopters to fire into Qaboon district of Damascus and that rebels and troops had clashed violently in Midan and Hajar al-Aswad neighborhoods. Other neighborhoods rocked since Sunday by fighting include Tadamon, Kfar Sousa, Nahr Aisha, Barzeh, Mazzeh and Jobar. (1) The armed rebels and the insurgents who linked up with them to set up joint fighting formations are now “a force to be reckoned with, despite their shortage of firepower and secure means of communication. They retain the unflinching support of Syria’s Sunnite majority. They proved their fighting prowess in urban and rural areas.” They set up a chain of command and they learned the difference between fighting army regulars and shabiha militiamen. (3) The speed and frequency of military operations since mid-May this year is increasing the army’s burden at an increasing rate. (4) Fighting fatigue, ceaseless defections, mounting casualties and growing suspicions between Alawite commanders and Sunnite rank and file soldiers are bound to wear away army morale. Nevertheless, The Daily Telegraph reports today from Washington that the U.S. is refusing to help Syrian rebels until after its presidential election. The Telegraph understands that the Syrian Support Group (SSG), the political wing of the Free Syrian Army (FSA), recently presented American officials with a document requesting 1,000 RPG-29 anti-tank missiles, 500 SAM-7 rockets, 750 23mm machine guns as well as body armor and secure satellite phones. They also asked for $6m to pay rebel fighters as they battle the regime. All their requests were rejected.